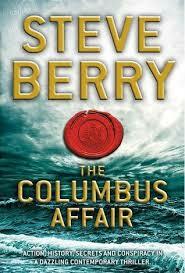 If you enjoy thrillers with a bit of historical bent ala Dan Brown (and I did enjoy the first book but never believed it) – then The Columbus Affair might be just your cup of something. This is the second of the two books my son gifted me and I want to get it read before the deluge of new books by old favorite authors hits in Sept.
Tom Sagan, a discredited and broken investigative reporter living in Florida, is readying himself for suicide when there is a knock on the window and a picture of his daughter face down on the ground. He has a strong Jewish background but converted to Christianity and then wrote an article on Jewish extremists (as well as Palestinians) which got him in massive trouble. Alle Beckett – his daughter, who is Jewish by conversion, is told by her grandfather, Tom’s father, an outline of information about something in his grave – she was told to put it there. The small package turns out to contain instructions on how to get some sacred objects which were rescued from the Second Temple in Jerusalem and stashed in Jamaica by Columbus. The Jamaican Maroons have held them safe – until now.